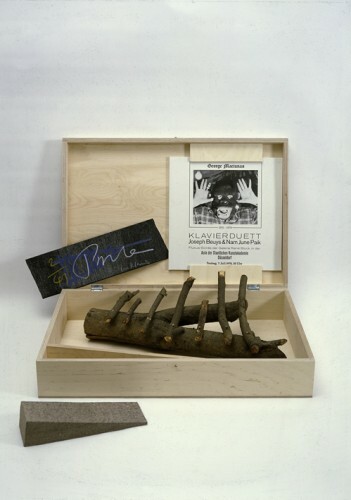 Wooden box with an LP of the George Maciunas memorial concert from July 7th, 1978 at Düsseldorfer Kunstakademie, the "Filzkeil" by Joseph Beuys and the "Urklavier" by Nam June Paik. As almost all Beuys-multiples published by Edition Block the Filzkeil is not signed. A part of the edition contains signature and numbering by Paik on a cardboard enclosed. 2 copies with signature by Beuys on LP cover. The copies that had not been sold after Beuys death in 1986 additionally contain the stamp of the Beuys estate with signature by Wenzel Beuys.